Help two adventurers recover a Dwemer relic to present to the Shad Astula Arch-Mage. Bthanual — Explore the Dwarven ruin, Bthanual. 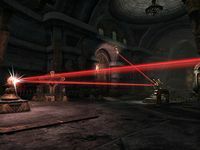 A Dwarven device fills a chamber deep within the ruins of Bthanual. Kireth has repaired it. Beams of light now shine through prisms set around the room.